Michael Buble belongs to that group of marvelous performers who never make their listeners worry about the quality of their upcoming albums. Forget about unpleasant surprises buying another nice record from this man. It is not about unoriginality or lack of creativity. It’s all about his unique and incomparable style. The artist once discovered a way leading him to success and brining us to pleasant listening. Everybody is happy and there is no need whatsoever to change anything. Of course, we can expect something new in arrangements and some new names in the list of guest performers, but this doesn’t count. The rest is the well known Michael Buble who doesn’t like and doesn’t have to modify his music. That is why he resorted to minimum, if any experiments while working in his last to this date album, Crazy Love. Even the title of this effort, simple and characteristic of his genre, suggests this: guys, you’re gonna hear remakes of famous pop-songs and radio hits. Again, this will be done at the highest possible level because there not so many musicians in the whole world who can do it like Michael Buble. Crazy Love is introduced with Cry Me a River where many might find a personal context considering Buble’s recent breakup with Emily Blunt that happened shortly before the making of the album. The lovers of his music will notice that this time Michael gathered a whole band of musicians alongside himself in the studio. Definitely, this is a good step for the record as the effect of live performance makes the music more charming. Yet while the first song may sound as if sung from the stage of a big venue, the subsequent track, All of Me, starts with a beautiful piano passage that takes you over to a remote and small restaurant where Michael is singing it specially for you. The same goes with You’re Nobody Till Somebody Loves You. Michael sings each line just as it is required by the mood and story of each song. He may be vivacious and merry like in Haven’t Met You Yet, or overwhelmed with light melancholy like in Hold On. By the way, both songs are original and penned by Michael himself. His voice may also appear as mysterious and intriguing as in Georgia On My Mind. You should not think it is about the American state or a country in Caucasus. Georgia is nothing but a girl’s name, and even if you did not know English you would understand it thank to the emotionality Buble sings this song with. 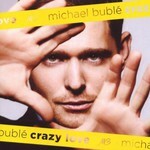 There is no other thing as useless as truing to find a single flaw in Michael Buble’s Crazy Love. If you are objective and do not feel, for some unknown reason, terrible hate for this artist, you will have to agree that everything in this work is splendid. The beauty of such kind of jazz is that you do not have to be a music expert. The songs are simple, easy to remember and strike right into your heart for a long while irresistibly. Why, indeed, resort to instrumental ‘complications’ if you have got such a magnificent voice! You can but feel happy that Michael is too young to think about aging and tiredness. Therefore, if nothing extraordinary happens to him, Michael is sure able to grant us with more albums. You will be astonished by the confidence that he emanates singing these songs, the confidence that he expresses looking at you from the folder of Crazy Love. However, there is a reason to be so confident. Huge and triumphant experience, rich talent and world recognition, all of these entitle him to be confident in himself. We, so far, can be sure that the next studio album by this performer will not let us down either.